We’re not letting the threat of bad weather dampen our school spirit again! The Bobcat Bash is on for Friday, November 9, rain or shine! Carnival is a Buena Vista family favorite, and it’s also one of the biggest fundraisers for the PTA. Many of the cool things we do for the school every year are possible because people like you support the Bobcat Bash. Organizers and the administration have put their heads together, and if the rain comes, there’s a backup plan. And a backup plan to the backup plan! No matter what…there will be rides! There will be games! There will be 200 cartons of confetti eggs and 500 cans of silly string! We will set up bounce houses in the gym, concessions and the silent auction in the cafeteria, and unless there is lightning, ZoomBall will still be outside under an inflatable tent. The bottom line is the kids will not be disappointed and neither will you. We might have to pull together to make some last-minute adjustments, but we know with our school family, anything is possible. The Bobcat Bash is a major fundraiser for the PTA that brings our community together every year to enjoy amusement rides, games, food, silent auction and fun! Many families have made the carnival a part of their fall traditions, but we are always excited to see the reaction from our first-timers! COUNTDOWN TO CARNIVAL VOLUNTEERS NEEDED! An event of this size requires dozens of volunteers, donations, and many months of planning and hard work. In the Countdown to Carnival, our committee chairs need a lot of help to meet their deadline. If you’re not already on a committee and want to help during the next couple of weeks, please CONTACT US. We will have one of our Bobcat Bash co-chairs get back with you as soon as possible. Set-up for the Bobcat Bash will begin on Thursday, November 8.. No experience necessary! Show up any time from 9am to noon. All volunteers helping with carnival prep and set-up during school hours will need to check in at the front office and get a sticker. The day of the Carnival, Friday, November 9th, we will need all hands on deck from morning drop-off to 3pm. Lunch is on us! Low-impact jobs include finishing the paper flowers, filling confetti eggs, and sorting prizes. Tougher jobs include lifting, moving, and setting up the heavy things (Dads, big brothers, uncles, super buff moms, we are talking to you!). Since we rescheduled Carnival, we need you to sign up again for your VOLUNTEER spots!! - CLICK HERE! Most of the set-up will be done before the first official Carnival volunteer shift starts at 3. The SignUpGenius is live, so if you have a favorite booth, claim your spot now! Once again, we didn’t assign the booths to specific classes this year, so you have more flexibility. You just pick a time and place that works for you, sign up, then show up! Your children are also welcome to work with you. There’s no need to get someone to watch them during your Carnival shift. Let them help by taking tickets, handing out prizes, or any other age-appropriate activity at your booth. First-time volunteers, don’t let those 3-4pm or 7-8pm slots intimidate you. “Set up” and “tear down” might sound hard if you’ve never done it, but those are actually the easiest shifts of the event! Most of the set-up is finished by the time the 3pm volunteers arrive, and for many booths, the tear-down at 7:30 is not much more than turning in the tickets you collected. That leaves only 30 minutes of actually running the booth! Here’s a LIST of Carnival booths and their descriptions. HAVE MIDDLE OR HIGH SCHOOL STUDENTS WHO NEED SERVICE HOURS? Organizers are looking for middle and high school students who are willing to help with this fabulous fundraiser! This year, volunteers get to choose where they want to work instead of being assigned to a specific booth. That means if your child wants to work with her BFF in the face-painting booth, they can sign up together! Click here to sign up for BOOTHS AND CONCESSIONS. We are especially looking for volunteers that can give 2 or 4 hours of their time to be Spooky Lab Talent - that not-so-scary spectacle needs volunteers who are willing to go all out and play characters who might creep the kids out a little…but not TOO much! The longer shifts help decrease transition issues like costume changes and training. Click HERE to email us about your interest in being a character in the Spooky Lab. Check in at the volunteer table set up at the Carnival entrance before your shift (This applies only to people volunteering after school during the carnival). The 3-4pm slots include last-minute booth set-up. The 7-8pm slots include breaking down. Tired of waiting in long car lines? Can't get to the school early enough to be at the front of the line? Have we got a solution for you! New this year is the Car Line Fast Pass Raffle!! For $10/raffle ticket, you get a chance to win a RESERVED PARKING SPOT for the ENTIRE SCHOOL YEAR! Located near the bus lane across from the outdoor classroom at the front of school, your child(ren) or carpool will be walked out to you when school lets out and you'll be on your way before any other cars in the car line. And that spot is yours to use for any event all year long. No getting "trapped" in the parking lot or car line! Raffle ticket pre-sales start October 14th, Forms will go home in Tuesday folders. Please complete and return with payment by November 7th. Tickets will also be sold the night of the Bash. We’ve made it easy for you to maximize your fun and minimize your wait by pre-ordering your tickets that you will need to ride the rides, play the games, and order the food. Pre-order using the paper form starting October 16. Turn in the FORM and your payment to your child’s teacher by Wednesday, November 7. Pre-ordered tickets will be sent home by November 8. Additional tickets will be available at the Bobcat Bash Ticket Booth. You might want to do a little math to figure out how many tickets to buy. Take into account how many people are in your group and how many rides and games they might play. If you underestimate, you can always buy more at the event, and if you overestimate, there will be countless students willing to help you spend what’s left. It’s a fundraiser after all! Tickets cost $0.50 each, but for every ten tickets you pre-order, you get one free! Since the Bobcat Bash runs from 3:30 to 7:30, you might also want to factor in concessions costs when you’re figuring out how many tickets to buy. Our concessions organizers have made sure your family can eat dinner and keep on playing at Carnival! The Silent Auction is back this year and even bigger and better than ever! In addition to our admin-sponsored items and class-sponsored gift baskets, we have donations from our Bobcat families, friends, and local businesses. Be sure to get in early and check out all the swag to bid on. Bidding opens at 3:30pm and closes at 6:30pm. 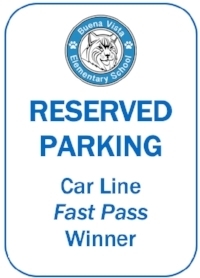 Admin is sponsoring reserved seats and parking at Bingo Night and the Holiday Chorus Program, You have an opportunity to “Name the Car Line” and “Name the Back Path” complete with your own street signs. And grade-level baskets are loaded with great keepsakes, fun items and valuable gift certificates. Keep an eye out as we begin regularly posting item donations to the Newsflash, Facebook and Instagram. Keep in mind this is NOT a ticketed game. All winning bids must be paid for with currency. You do not have to be present at the end of the auction to be the top bidder of an item. Auction organizers will follow up if you do not claim and pay for your winning item the night of carnival. Parking during Carnival is extremely limited. We encourage you to carpool or walk if you can. Canebrake has agreed to open its pool parking lot that afternoon and evening to provide us with a few more spaces. Please be considerate of the people who live around the school and do not block their driveways or the roads. Most importantly, drive carefully and watch out for excited little Bobcats eager to cross the roads and the parking lots to get to the fun faster! In the final weeks leading up to the Bobcat Bash, we typically have some important information, changes, and requests to pass along to you. Subscribe to the PTA Newsflash that comes out every Sunday (if you haven’t already) by submitting your email address at the bottom of this page (just scroll down!). Follow us on FACEBOOK and INSTAGRAM (@bvepta) where we will post the most updated information as well as last-minute messages and requests!